The fantastic yellow colour of Citrine is named after the French word for lemon, bringing a cheerful touch to your jewellery collection. The colour range of Citrine includes yellow to gold to orange brown shades of transparent quartz. Sunny and affordable, citrine can brighten almost any jewellery style, blending especially well with the properties of silver. Although the darker, orange colours of citrine is sometimes called Madeira citrine after the colour of the wine, this shade has generally been the most valued colour. Citrine has been popular for thousands of years and used to be revered for its rarity, though that has changed with time. The ancient Romans used it for beautiful jewellery and intaglio work. It was also very popular for jewellery in the 19th century. During the Art Deco period between World War I and II, large citrines were set in many prized pieces, including the massive and elaborate Art Deco inspired jewellery pieces made for big Hollywood stars such as Greta Garbo and Joan Crawford. Citrine is the birthstone for the month of November, sharing the title with topaz. In fact, the citrine stone has been used to imitate topaz and was once called Brazilian topaz. 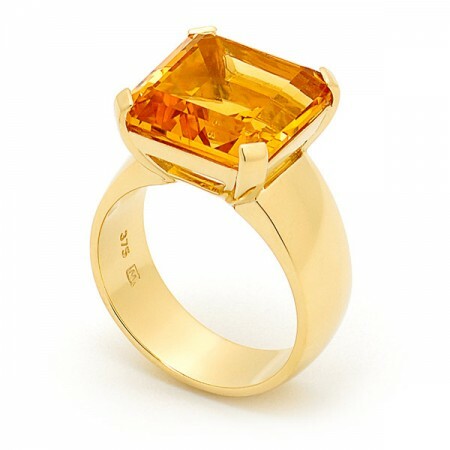 Citrine is also the gemstone that celebrates the 13th anniversary of marriage. Citrine is named after the French word Citrin, meaning lemon. The color of citrine ranges from straw and sun yellow to clay orange, to deep, wine colored Madeira red. In the past, the Madeira coloured stones were the most valuable, but today, the more vivid yellows and oranges are the most popular. Natural bright yellow citrine is the rarest of the quartz varieties.